This very famous English surname has two totally contradictory origins, although both are nicknames and both are possibly nationalistic. The derivation is from either or both the pre 7th Century adjective "blac" which does translate as "black", and means black haired or dark complexion, and may have referred to the native Olde English (the Celts), or the almost similar "blaac" meaning white or fair haired or fair complexion, which possibly referred to the invaders from east, the Jutes, Angles and Saxons. Later in Middle English (1200 - 1500 a.d.) the two words came together as "blake", making it impossible to distinguish whether the name derived from a dark person or a fair person. A sizeable group of early European surname were created from the habitual use of nicknames. These were given with reference to occupations including acting, or to a variety of physical, moral or perhaps national characteristics! 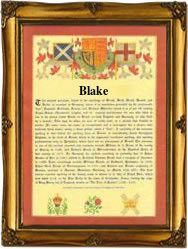 The Blake surname (see below) is first recorded in the latter half of the 12th Century, making it one of the earliest on record, whilst later interesting examples of the name recordings taken from the 'Dictionary of National Biography' include the famous Admiral Robert Blake, 1599 - 1657, who destroyed the Spanish Fleet at Santa Cruz, and died on the way home, and Francis Blake, who earlier in 1635 had embarked from London on the ship "George" bound for Virginia. He is believed to have been the first of the many Blake's to colonise New England. The first recorded spelling of the family name is believed to be that of Walter le Blake. This was dated 1167, in the "Pipe Rolls" of the county of Devonshire, and during the reign of King Henry 11nd, known as "The Builder of Churches", 1154 - 1189. Surnames became necessary when governments introduced personal taxation, and in most cases, but not seemingly this one, surnames in every country have continued to "develop", often leading to astonishing variants of the original spelling.